KANSAS CITY, Missouri — Domestic terrorism. That’s what one of the police officers who lived through a terrifying, and deadly, day in Overland Park, Kansas, said we’d call the crime if it happened today. But despite the sensational nature of the crime, it seems to have been practically forgotten in one of the largest cities in Kansas. 41 Action News anchor Taylor Hemness spoke with people who were there, including a police officer and civilians, as well as family members and friends of the robbers, and of the Kansas State Trooper who became the first to be killed by gunfire in the state’s history. It started at the Overland Park City Hall on January 19, 1968. Four people, led by a man named Henry Floyd Brown, put a soda can stuffed with five half sticks of dynamite outside city hall. Myron Scafe spent nearly 25 years as the chief of the Overland Park Police Department, but on that day, he was just an officer moving into his new office at city hall. “I was in my office, and putting things in shelves and drawers, and the desk, when the explosion took place,” Scafe said. “I smelled some smoke, and part of the building had been blown away." The original complaint from Johnson County Magistrate Court says damage was done to a brick wall and an air conditioning unit at the northwest corner of City Hall. It lists the approximate repair costs at $3,000. That amount today would be more than $22,000. Read the criminal complaint here. But even in the moments after the blast, Scafe knew that something else was going on. “Immediately, it occurred to me that this was a diversion," Scafe said. He was right. Just a few blocks down the road, two men, Henry Floyd Brown and Andrew Evan Gipson were robbing Metcalf State Bank, at the corner of 79th and Metcalf. That bank is still there, but today it’s called the Central Bank of the Midwest. FBI photos from inside the bank show the pair before they got away with a little more than $13,000. From the bank, the criminals were chased by police and fired at police officers with a rifle, injuring motorcycle officer Chester Sundbye. They were able to evade police, largely because they stole another car at gunpoint from Howard and Erma Upton. The complaint describes the car as a 1966 blue Chevrolet convertible, with a white canvas top. They ended up at the Heatherwood Apartments on Robinson Street, where Brown was living at the time. It’s unclear exactly when the four bank robbers separated because there was a lull between when the bank robbery occurred and when police arrived at the apartment complex. Police got a tip about the location of the stolen car, but by that time, Gipson, Wilane, and Goetz were gone. Brown was inside his apartment, just across the hall from a then 21-year-old Sandy Krumm and her 2-month-old son. “All of a sudden, someone's knocking at the door, and it's a policeman in the hallway," Krumm said. “They said there's been a bank robbery, and they think that the suspects may be in this apartment area, and they're checking all of the apartments." While that sounds alarming, especially for a young wife home alone with her infant, it wasn’t that knock on the door that alerted her to the true danger. Police had discovered Brown next door and tried to enter his apartment. But, he had an array of weapons and no intention of going quietly. What happened next could have killed Krumm or her baby. A gunfight erupted between Brown and police. Scafe was grazed in the gunfight. Back across the hall, bullets were tearing through the walls of Krumm’s apartment. The police took her to another room and told her to get to another building for cover. “We're coming out the bedroom window on the side, and I'm handing the baby out the window to a police officer, and I'm crawling out the bedroom window," Krumm said. Brown was eventually shot in the stomach, and taken to a local hospital. 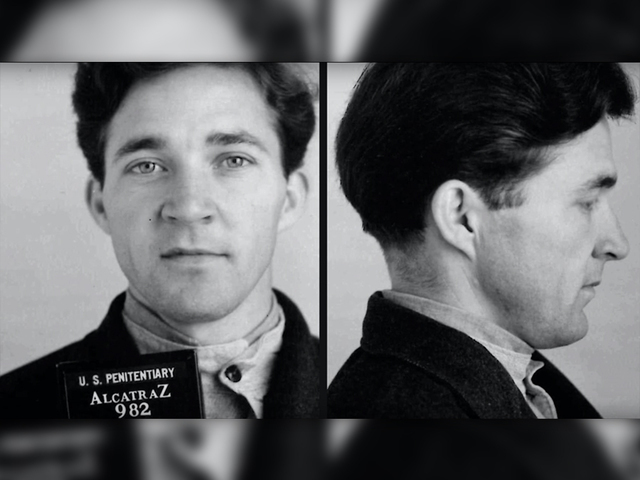 His three accomplices were either captured or surrendered days later. There are conflicting reports on Brown and Gipson's intentions in committing the crime, especially on a larger scale. 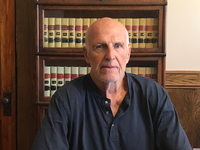 Scafe told 41 Action News that Brown was a member of the Minutemen, an anti-Communism group that was especially active in the United States in the 1960s. He also indicated that Brown's plan was to overthrow the government, and the number of weapons stockpiled in Brown's apartment supported that theory. Brown's longtime friend and attorney Joe Vader told us that, as far as he knew, the plot went no further than Brown and his three accomplices. Krumm told us that she and her family were allowed back into the apartment the day after the shootout, and she described the scene to 41 Action News. "When we came back the next day and took pictures, there were bullet holes in the door jamb of the kitchen," Krumm said. "One bullet hole in a table, one bullet hole in one of our chairs... There was a bullet hole in [her infant son Dale's] crib." And along with the damage to the apartment, Krumm suffered from a form of PTSD thanks to that terrifying day. "After it was all said and done, I couldn't listen to gunfire on television for a long time," Krumm said. "That first time that I heard gunfire on television — it might have even been 'Gunsmoke' or something like that — and I thought, 'I can't hear this, I just can't hear this.'" 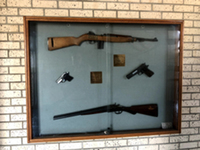 The weapons used in that gunfight are still on display at the Highway Department Training Facility in Salina, Kansas. Krumm escaped unharmed. One officer who responded to the scene did not. Sgt. Eldon Miller, 48, of the Kansas Highway Patrol, moved a patrol car to provide cover for his fellow officers. 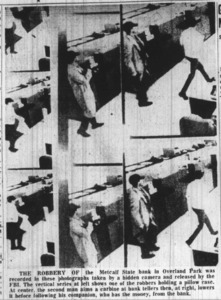 Brown fired out of the apartment, and the bullet went through the windshield of the car, killing Miller, and making him the first Kansas highway patrolman killed by gunfire in the line of duty. Darren Mosher is Sgt. Miller's great nephew. "I can see him," Mosher said. "It didn't matter what car he got into, to help those who were under fire." Miller became a trooper in 1953, after attaining the rank of Staff Sergeant in the U.S. Army Air Corps. 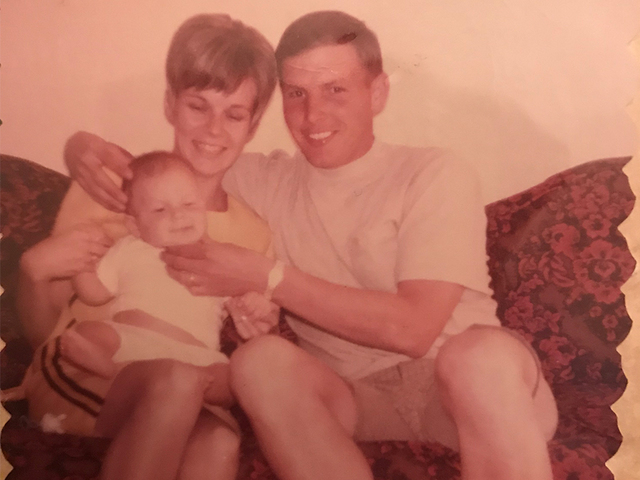 “The first time I learned what happened to him was in my baby book,” Mosher said. “The front of my baby book has the article with the four bank robbers and his death that day." Ironically, Mosher retired this year from the Johnson County Sheriff's office. He and his family worked tirelessly to make sure Sgt. Miller's sacrifice is remembered, and just recently, that work paid off. 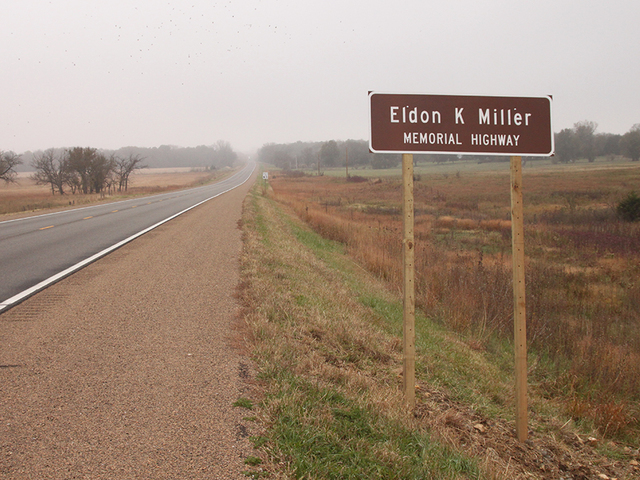 A section of U.S. Highway 75 outside of Miller's home of Yates Center, Kansas is now named for the fallen officer. At the beginning of this story, it was mentioned that there were four people involved in this crime. Along with Brown and Gipson, the two others were women: Karen Goetz and Bonnie Wilane. Wilane was captured by police in Cedar Rapids, Iowa. Goetz went on the run with Gipson for 11 days, but eventually, the pair turned themselves in. All four of the bank robbers are now deceased. But their actions are still felt today. Terry Wilane, Bonnie's son, told us that her role was the makeup, hair, and clothing that Brown and Gipson wore when they went into the bank to rob it. He said her reason was simple. “She was in love,” Wilane said. “She was very embarrassed by it. Our family was destroyed." 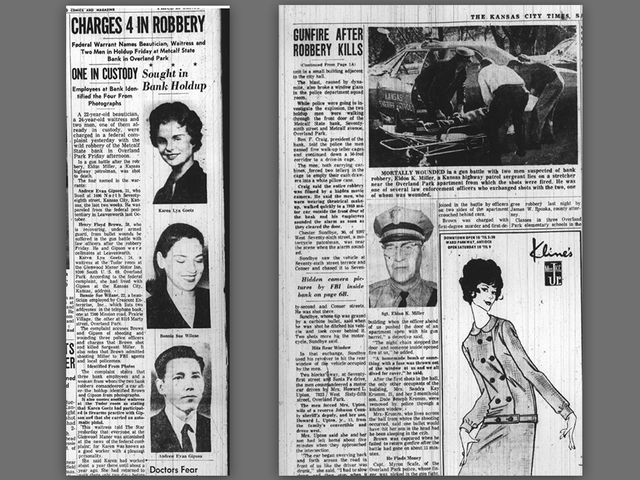 Brown escaped from prison twice after the 1968 bank robbery in Overland Park. Vader, Brown's long-time lawyer and friend, told us that in one of those escape attempts, he convinced a prison band to smuggle him in a drum to the venue where they were performing. Vader also described his first meeting with Brown. He'd been assigned to defend him, and their first meeting took place in the hospital. Brown was there after the gunfight since he'd been shot in the stomach. Brown was released from prison in 1997, and moved back to Kansas City, but died in 2016. 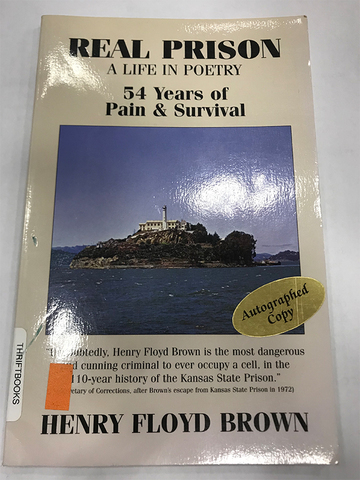 He wrote a book of poetry entitled 'Real Prison: A life in Poetry 54 Years of Pain & Survival,' detailing his life behind bars. In it, he references his accomplice, Bonnie Wilane, several times. He talks about his childhood in Arkansas, along with the years he spent in prison for other crimes before the Overland Park bank robbery. We ordered the book on Amazon, and when it arrived, were surprised to find it was a signed copy.